Kenny White is on a hot streak on his college basketball picks. Prairie View A&M and Fairleigh Dickinson have won 19 combined games heading into the NCAA Tournament. Something has to give Tuesday night when they meet in the West Region play-in game. Tipoff is set for 6:40 p.m. ET from the University of Dayton Arena in Dayton, Ohio. One of these No. 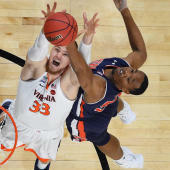 16-seeded clubs also will break through a history of futility in the NCAA Tournament, as they are 0-6 combined heading into Tuesday's matchup. The Panthers (22-11) appeared more than a longshot to reach any sort of postseason action after their struggles included an 11-game losing streak. But they bounced back to win the regular season and tournament titles in the Southwestern Athletic Conference championship. The Knights (20-13) were 4-7 at one point but surged down the stretch and sealed their invitation by winning the Northeast Conference championship for the second time in the past four years. The Knights are 2.5-point favorites and the over-under for total points scored is 149 in the latest Prairie View A&M vs. Fairleigh Dickinson odds. Before you make any Prairie View A&M vs. Fairleigh Dickinson picks, checkout what SportsLine expert Kenny White has to say. The pioneering Las Vegas oddsmaker is widely considered one of the most influential figures ever in the sports wagering industry. White is the former head of Las Vegas Sports Consultants, which supplied odds to countless sportsbooks that made millions off his expertise. By age 26, the oddsmaking prodigy was setting lines for Nevada's biggest casinos. Now, he is using his innate knowledge of point spreads and handicapping as one of SportsLine's top analysts. White heads into the NCAA Tournament on an impressive 16-7 run with his college basketball picks. Now, he has analyzed Prairie View A&M vs. Fairleigh Dickinson from every angle and released a confident point-spread selection that is only available at SportsLine. White knows the Knights have been one of the more efficient teams in the country on both sides of the ball, but their improved defense has been at the core of their recent success. They have held 19 opponents to 70 or fewer points, including six of their last eight. They will need to clamp down against a Prairie View team that averaged 86.3 points per contest in the SWAC Tournament. Fairleigh Dickinson's offensive balance includes five players who average double figures, led by senior guard Darnell Edge with 16.4 points per contest. The Knights are among the better-shooting teams in the country at 47.8 percent. They also share the ball well, averaging 14.1 assists per game. But just because the Knights are playing well on both sides of the ball doesn't mean they'll cover the Prairie View A&M vs. Fairleigh Dickinson spread in the First Four 2019. The Panthers rebounded from an early 11-game losing streak to win 21 of their last 22 games, capturing the SWAC regular-season and tournament titles for the first time in the program's history. They have defeated their seven opponents in March by an average of 17.4 points. Prairie View finished off its SWAC Tourney sweep with a 92-86 victory over Texas Southern in Saturday's title game. The Panthers shot 54.2 percent from the field and their defense forced 24 turnovers. Gray Blackston and Dennis Jones led the way with 17 points each as six players scored in double-figures. We can tell you White is leaning over, but his stronger play is on the spread. He has scoured this matchup and unearthed the critical x-factor that will determine the outcome. He's only sharing what it is, and who to back, at SportsLine. Who wins Fairleigh Dickinson vs. Prairie View A&M? And what critical x-factor makes one side of the spread hit hard? Visit SportsLine now to find out which side of the Fairleigh Dickinson vs. Prairie View A&M spread you need to jump all over Tuesday, from the Vegas legend who is hitting 70 percent of his recent college basketball picks.